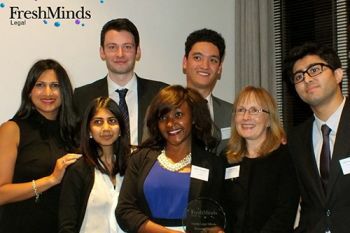 Five students taking the Legal Practice Course (LPC) at The City Law School have won the 2013 Young Legal Minds competition. Sharon Kimathi, Rekha Makwana, Stephen McNeill, Hammad Naveed and Joshua Schuermann beat teams from the University of Law and BPP to secure first place and an in-house work placement each. The City team triumphed during the finale of the competition, a negotiation meeting, which took place in the boardroom of leading international law firm Mishcon de Reya. Each team was tasked with representing parties in the potential takeover of a technology company by a famous investor. The aim was for the three teams to come to a win-win agreement, whilst achieving as many of their own commercial goals as possible. "Despite fierce competition, it was team work which ultimately made the difference for the winning team. What stood out for me was the way in which all members of The City Law School team contributed to the negotiation and, when the going got tough, how they pulled together to overcome the challenges from the other teams." Linda Jotham, Deputy Programme Director of the LPC at The City Law School, was responsible for putting the team together and preparing them for the competition. "I am immensely proud of our students' success against such strong opposition. The City Law School has an excellent track record in legal competitions and I'm delighted that we have added to that. Negotiation is a key skill for commercial lawyers and the students will have learned a great deal from participating and from the mentoring which they received." "They were calm, confident and had a very organised and structured approach. I watched with pride as they ran a mature and thought out negotiation and navigated the tactics of the other, equally strong, teams with such ease. The calibre of students that took part in the competition gives me confidence that the future of our legal profession looks very bright indeed". The competition was established by Fresh Minds Legal in response to a perceived lack of in-house commercial awareness at a junior level.